A stranger surreptitiously takes control of a New Hampshire town in The Auctioneer, a novel by Joan Samson. Published in 1975, the novel may have lost its popularity over the years, but none of its potency. The stranger is Perly Dunsmore, a smooth-talking auctioneer, who soon after arriving in Harlowe starts organizing auctions for the benefit of the local police force. A one-officer town, Harlowe is apparently in dire need of more deputies, because crime is on the rise. The items for the auctions are donated by local people, who in turn get rid of all their needless junk. But after they’ve given all they can willingly give, the collectors (the new deputies, local thugs now with badges) keep coming, every Thursday, with stories of how people who refused to donate items for the auctions have met with “accidents”. Under the implied threat of violence, most keep on giving, until they have nothing left. And still the collectors keep coming for more. For the land and even for the children. The story is told from the viewpoint of the Moore family. Like in H.G. Wells‘ The War of the Worlds, the Moores often hear about events secondhand; for the most of the novel, they are alone in their predicament. It’s only when the town finally gets together that people are spurred into action. But even then, Perly seems to hold the upper hand, making the townspeople, now a violent mob, give away their last ounce of decency. It’s partly an allegory, but Samson is clever enough to keep things general enough to avoid any direct comparisons. Perly could be a herald of commercialism or totalitarianism, and there’s maybe even a government gone rampant angle for Libertarians to gnaw on. Or Perly could simply be the devil, a reading that is equally valid. 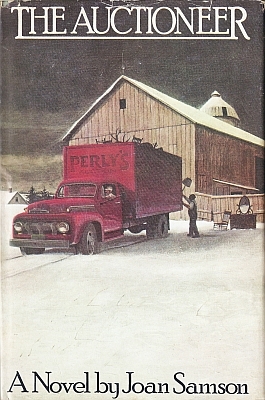 At its roots The Auctioneer is in the tradition of Shirley Jackson, with shades of Franz Kafka; the novel has no doubt influenced such authors as Stephen King and even more probably, Bentley Little, who has made this sort of allegorical tales about society his trademark (The Store, The Association and many others). Samson’s writing is solid, but the novel has its drawbacks; the Moores’ lifestyle seems far too backward and almost anachronistic for the mid-seventies. The structure of the novel also pretty much trumps the characters, with the middle of the novel mostly taken over by the repetitive Thursday visits. The Moores’ helplessness is also depressing to say the least. That may be the point, but it’s possibly also one of the reasons why the novel has passed into semi-oblivion. The tale of The Auctioneer is not the Great American Story many want to be told. But it is a necessary tale.